We are rife with involuntary reactions. We know why we sneeze. We know why we cough. We know why we blink our eyes. But we don’t really know why we laugh. Sense of humor is personal but everyone has one. We weren’t built with extraneous physiological processes; everything our bodies do has a purpose. So while we may not know why we laugh, we now know that doing so contributes to physical and emotional health. In the 1970s, Norman Cousins, editor of the Saturday Review, published his story of laughter as medicine in The New England Journal of Medicine. He subsequently published books on the subject of mind-body healing: Anatomy of an Illness, Head First, and Mind Over Illness. In these, he explores his experience of having been diagnosed with life-threatening heart disease in 1964 for which he self-treated with massive doses of vitamin C and laughter. (Cousins died in 1990.) His story spurred scientific research into the physiology of laughter–gelotology. Many studies have now shown that laughter does, in fact, promote wellness. Laughter appears to occur more frequently and has a greater physical impact when it occurs in a group setting. Laughing alone is good but laughing with others is even better. 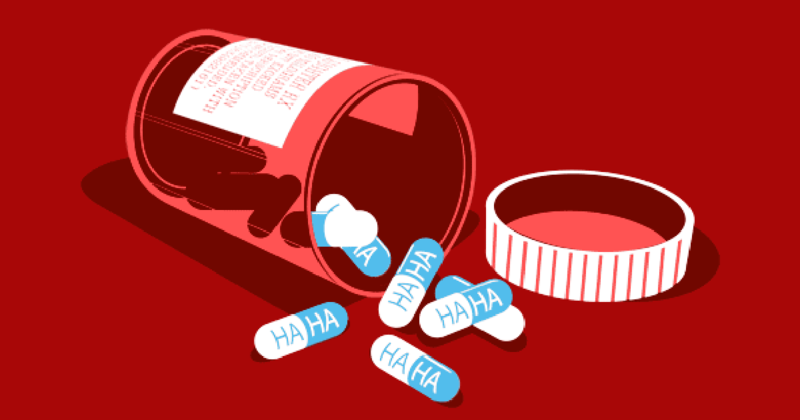 The physical act of laughing causes the release of endorphins–neurotransmitters that moderate pain and stress with an opiate effect. In a controlled study, pain threshold was significantly higher after laughter than without. Even anticipation of the prospect of “mirthful laughter” reduces stress hormone levels and increases endorphins and human growth hormone (which contributes to optimizing immunity).